Pranav Mistry has developed some tools that can integrate the outside world with the paper or digital one that idea a reality. He has invented a group of applications linked to a hardware device called SixthSense, that makes it possible to combine the tangible environment with the information universe. Functional applications such as the one that can read sticky notes, another that projects maps on any surface or the one that recognize drawings and gestures work on Mistry's prototype mobile computing device. This prototype has two physical components. One with a pocket size process the information. The other which has the tiny projector, camera and mirror must be worn as a necklace and is of small size too. Mistry's approach is to make information in our physical world more available the in order to make life experiences richer. Having on hand all the information that the human beings have accumulated over many years can avoid the attitude of being "a machine behind another machine" (TEDtalksDirector 2009). Mistry argues that human beings are interested in information and integrating it in their everyday objects to help them be more connected to the physical world. I think this project is very powerful but it is important to try to predict the wrong uses for this invention in order to prevent or reduce the negative impacts and maximize the advantages. More information at SixthSense web page. - Records audio and video in AVI format. - Has movement sensor mode, with a movement registered starts to recording. - Gives the time. Forks as a real clock. Allows to be aware of the time. - Continuous recording while there is any movement. Save battery time. On the back has a discrete indicator LED. - Works as pendrive. With 4GB MicroSD memory stores all documents including the videos taken. Stores the equivalent of 6 hours of recording. Have you ever thought of sharing what you just saw a couple of minutes ago? Or simply capturing a unique moment when you were doing that extreme bike ride or climb? Now it is possible, thanks to the Spy Sunglasses which have a hidden camera that enables you to take pictures and record at the same time as protecting your eyes from the sun. You don't have to carry or install any equipment, just turn on your glasses and use them! 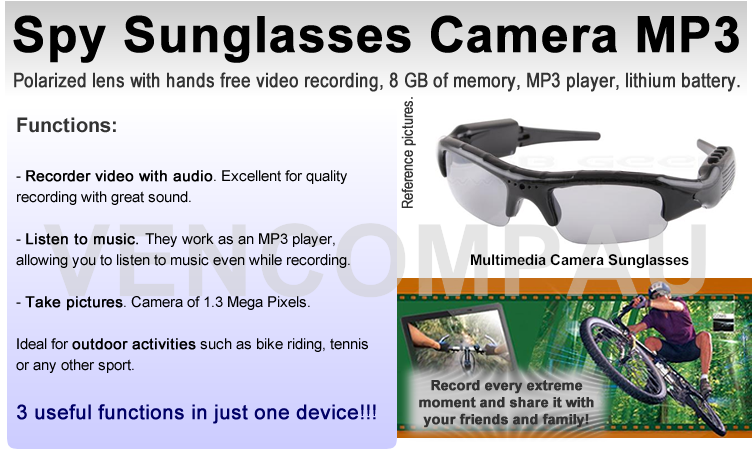 As these features aren't enough, the Spy Sunglasses also allow you to listen to MP3! Believe what you are reading, this is not a futuristic item, you can get this wonderful Spy Sunglasses now from us VENCOMPAU on eBay in Australia. 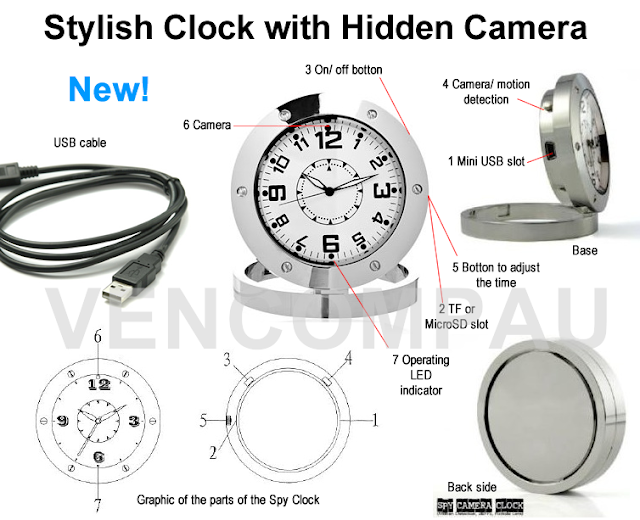 We also offer similar items in the USA with VENCOMP USA as well in Venezuela with VENCOMP.